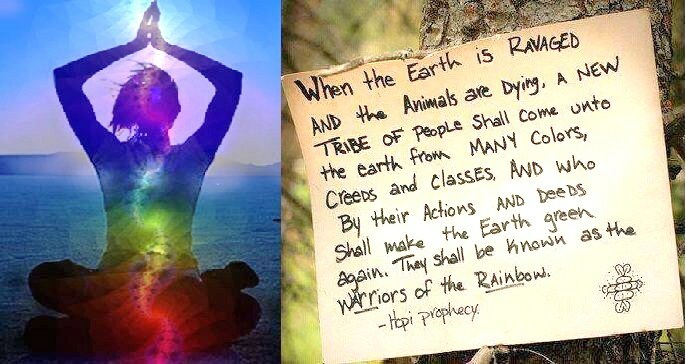 WHO ARE THE WARRIORS OF THE RAINBOW?? The rainbow band of VIBGYOR colors that are frequencies of vibrating energy seen in the sky, are the same frequencies of vibrational energy that exist within the human body as well, at the different energy centers called ‘chakras’. There are some people who are of the view that the chakra system is an implant for manipulation and control of human beings. Well, these are sadly the people who do not know how to use this energy system for good. Energy takes on the quality of the consciousness guiding it. If your consciousness is good, you will make wonderful use of this energy. If you live in fear and your consciousness is dark, you will use this energy system for dark deeds. For further insights, do read my article on ‘Sapta Swarga – Sapta Patala’, which explains that the 7 Heavens and 7 Hells are zones of vibrational energy. The ‘Sahasrara’ chakra at the top of the head holds the highest light frequency range of 668-790 THz, which give the colors Violet / Gold / Silver. This area holds the spiritual energy in the human body. The next lower chakra holds the intuitive energy (color indigo), also called the third eye. The next lower chakra holds the expressive energy (color blue), then the emotional energy (color green), then the character energy (color yellow), then the sexual or creative energy (color orange) and then the survival energy (color red), at the base of the spine that vibrates between 400-484 THz. All these energies centers are present in a newborn baby too, though only at a mild intensity, and as the baby grows, each chakra starts growing in intensity and maturing one after the other at intervals of 7 years. It starts with the lowest chakra at the base of the spine, and then the next higher one, and so on, till the last chakra at the head completes maturing at the age of 49 years. This is the unfolding of the human blueprint whose codes and relays are actuated by the astral body that is resident within the human body. This is the natural ‘kundalini awakening’ as per the original design of the human blueprint. When it does not happen the way it should (which is the state of most human beings in our present times), we need to resort to all sorts of mind, body and spirit therapies to fix the imbalances. This fascinating science has been explained in more detail, in the chapter ‘Metaphysics of The Human Body’ in the free e-book ‘Become Healthy or Extinct’ at www.becomehealthyorextinct.com. It is the knowledge of master genetists who have guided the evolution and devolution of the human species through the ascending and descending ages on this planet. They are the same beings who have now started helping evolved human beings energize their 8th, 9th, 10th, 11th & 12th chakras to take them to our next evolutionary leap in this Age of Aquarius. As you read this chapter, you will understand how these various energies within us express themselves as behaviours, qualities and traits, which are the various expressions of human life and living. The range at the top has the aspects of ‘Shiva’ energy, and as you come lower, it has the aspects of ‘Shakti’ energy. They are also known as masculine / feminine or yin / yang and they also express themselves as scientific / spiritual traits, views and acts. It is further explained in the book, that physical disease during one’s lifetime from birth to 49 years, past life memories and energetic imbalances, get mapped to these energy centers prior to their maturation and this causes disruptions in their complete energization. It is from weaknesses in these energy centers that all emotional and energetic imbalances come. This is why we have become a species not intellectually, emotionally and spiritually developed enough to take care of ourselves as well as other forms of life around us that support our existence. All types of inward meditations, visualizations, kriyas and shiv-shakti / so-hum / ham-sa breaths serve the purpose of clearing past influences and balancing the imbalances. The construct of these energetic centers as a whole is called ‘The Rainbow Lightbody’. The human being who modulates these energies, as and when required in daily life, practices ‘mastery of the rainbow lightbody’. Masters of the rainbow lightbody bring forth spiritual, intuitive, expressive, loving, individualistic, creative and confident thoughts, words and deeds all the time. By this, they become beings balanced in mind, body and spirit. These are the traits of our future selves, the beings our children, and then we will become in the near future, beings capable of making ‘Heaven on Earth’. The mastery of the rainbow lightbody does not happen by just watching the breath or chanting mantras, or repeating the words ‘So-Hum’ or ‘Ham-Sa’. These practises are used to clean the physical, energetic and astral bodies of redundant memories and unwanted traits. Mastery of the rainbow lightbody comes from being engaged completely in every aspect of life, yet never loosing one’s Shiv-Shakti balance. Blessed are those who balance Shiva & Shakti all the time, by moving in and out of them as need be, for they are our teachers of Unity Consciousness. Mastering Unity Consciousness within and without is the stairway to Christed Consciousness. These two lines are from the page www.fromthealphatotheomega.com/science. Do read it to understand more. Most think that the rainbow lightbody is something new, but it is not. It is as old as the first human being, and even older. That we are understanding it only now, shows how un-aware we are of our own selves. There are different aspects of light, different ways of using the aspects of light and also different degrees to which you can use light. If you’ve seen my work, you will notice that in this lifetime, I’m working with ‘the light of information and understanding’. Maybe you have chosen your own unique way of working with light. Over the years, you may have even noticed yourself graduating from Lightbearer > Lightserver > Lightworker > Lightwarrior. ‘Rainbow Lightworkers’ are those who engage in the mastery of their rainbow lightbody, so that they can use their energies with proficiency, to more effectively serve Humanity & God in their best capacity, according to their individual blueprints. Mastering your rainbow lightbody is a pre-requisite to developing your stable 12 chakra system. 2014 promises to be a turbulent year for all of us, but it will see the grand retreat of the dark side, if you step it up and shine your light brighter and brighter, day after day!